Save 10% on all HVAC Furnace Filter Bundles and Enjoy Low Flat Shipping on All Furnace Air Filters and Filter Bundles! Did you know that the Honeywell Store is a leading online retailer for acquiring an selection of award winning Honeywell Filters and accessories? Not only are Honeywell HVAC Filters extremely durable and efficient options to utilize for your furnace or heating and cooling system, they carry the additional bonus of saving you a substantial amount of money by eliminating the need to repurchase inferior filter replacements. Speaking of saving money, the Honeywell Store will be featuring an online store exclusive applicable to all HVAC Furnace Filters. When you bundle your preferred Honeywell HVAC Filter, you'll be saving an additional 10% off your purchase! The savings don't stop there. The Honeywell Store will also be including a low flat shipping rate on all applicable furnace filters and bundles! Improve the overall quality of the air you breathe with Honeywell's broad selection of Honeywell HVAC Filters. Featuring a near effortless installation process, Honeywell HVAC Filters are extremely accessible and do not require the assistance of a professional. Capable of capturing a high percentage of airborne particles, Honeywell Furnace Filters are considerably more efficient than standard fiberglass filters and include multiple MERV ratings to select from. Overall durability and lasting power have also been addressed as these filters showcase a prolonged lifespan that can reach up to six months depending on the air flow within your surroundings. Honeywell Filters can be placed in all Honeywell models and a series of Aprilaire, Space-Gard and Trion Air Bear units. The Honeywell Store is a premier online destination for purchasing any number of convenient and performance exceeding Honeywell Home Air Quality products. 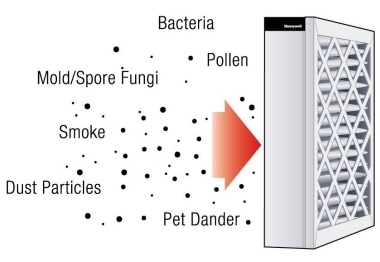 The Honeywell Store's secure online servers feature a wealth of Honeywell Humidifier Filters, Air Purifier Filters and Furnace HVAC Filters that can all go a very long way in promoting a healthy breathing environment for your home or place of business. Should you have any questions, our product descriptions have been further bolstered to include vital information specific to each and every Honeywell filter we sell. At the Honeywell Store, all of us strive to make your shopping experience an informative, accessible and seamless one. Our first class customer service team is also available (8am-5pm Central Time) to answer any inquiry you may have. For additional information, please visit the Honeywell Store and secure your purchase today! Save 10% On All HVAC Furnace Filter Bundles! Captures High Percentage of Airborne Particles. Easy to install and replace, no need for professional. Last up to six months depending on air flow. Several Merv ratings to choose from. More effective and efficient than standard fiberglass filters. Fit all Honeywell and many of Aprilaire, Space-Gard and Trion Air Bear furnace models.